HAOSIHD T95M TV Box is equipped with newest android 7.1.2 operating system which introduces a variety of new features and capabilities for you. You will have a unprecedented experience when you use T95M TV box to play games, watch movies and TV shows without freezing and buffering. Why Choose HAOSIHD T95M Android TV Box? T95M TV box brings you 4K Ultra High Definition streaming capability, giving you a best-in-class television experience with true-to-life picture quality when used with compatible 4K HD TVs. Infrared Remote Control Receiver Module Design make it no need to press the button face toward the TV box. ANDROID 7.1.2 OS: Come with updated android 7.1.2 Marshmallow OS, which is faster and more efficient. T95M android box has a better compatibility of software, games and applications, better user interface and user experience. 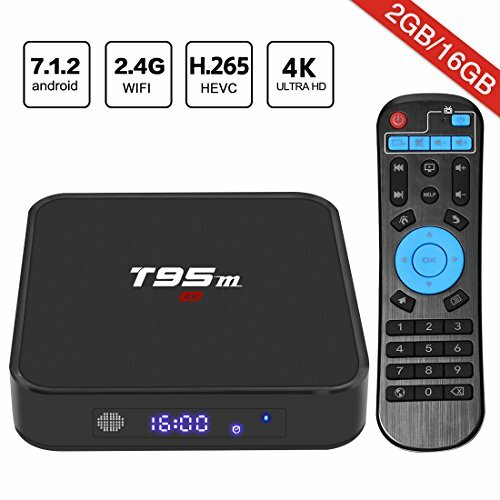 HIGH REACTION SPEED: HAOSIHD T95M Android TV box provides plentiful room 2GB RAM 16GB ROM and 64 bit CPU to quickly start your apps and games. You can also add an extra TF card to expand storage, which improves the reliability of your TV box and prevents crashes due to lack of memory. EASY & CONVENIENT TO USE: T95M Android Smart TV box built-in 2.4GHz Wi-Fi, support 100M Ethernet LAN. We offer convenient connection and more stable WIFI signal to enjoy higher quality video experience. Just plug in the power supply, connect the box HDMI cable and Wi-Fi/Ethernet, you can watch whatever you like.